What Is Ethanol and How Is It Produced? Ethanol is the chemical name for ethyl alcohol. Ethanol is a biofuel made from various plant materials. More than 95 percent of gasoline in the United States contains ethanol. E10 contains 10 percent ethanol and 90 percent gasoline, an oil product. The ethanol component oxygenates fuel and reduces air pollution. Ethanol is a clear and colorless liquid. Ethyl alcohol and grain alcohol are other names for ethanol. Whether produced from starch or sugar-based feedstock, ethanol has the same chemical formula and properties. The process of refining sugar or corn into ethanol is a processing or an inter-commodity spread. Ethanol has a long and storied history as a fuel. The Model T, The Ford Motor Company's first car, ran on corn-based ethanol in 1908. MTBE (methyl tertiary butyl ether) once was the oxygenating factor for gasoline, but ethanol replaced it in 2003. MTBE contaminated groundwater, and ethanol became the preferred environmental choice. Since 2003, most fueling stations around the United States now provide ethanol blended fuels. New laws, including the Alternative Motor Fuels Act (1988), Clean Air Act (1990), Energy Policy Act (2005), and The Renewable Fuel Standard Program (RFS) signed in 2006, have all mandated ethanol blending in fuels. While E10 is the blend used for most engines, E85 is a blend that contains 85 percent ethanol and 15 percent petroleum fuels. Engines specifically designed or converted for this high alcohol fuel are the only ones that can use E85 fuel. Aircraft do not use ethanol blends, but some marine engines can run on a 10 percent blend. As of 2009, 75 percent of America's gasoline for automobiles contains some amount of ethanol. The United States is the largest producer and exporter of corn in the world. Therefore, in the U.S. ethanol production comes from corn. In Brazil, which is the largest producer and exporter of cane sugar in the world, ethanol production comes from sugar. As both sugar and corn are agricultural crops, there is a high degree of correlation between ethanol prices and the price of corn and sugar. Ethanol actually contains less energy per gallon than gasoline. That is why blending with gasoline produces optimal results in terms of both fuel efficiency and diminishing pollution. Ethanol is biodegradable, nontoxic, and it dissolves in water. The U.S. Department of Energy encourages the use of ethanol as a fuel. Ethanol produces emissions with less carbon monoxide and carbon dioxide when compared to fuels that are totally gasoline based. Ethanol is a volatile commodity. In 2012, when corn prices made all-time highs at almost $8.50 per bushel, the price of ethanol was almost $2.60 per gallon. In 2011, when sugar traded up to 36 cents per pound, the price of ethanol was $2.93 per gallon. In late February 2015, corn was around $3.90 per bushel and sugar was trading at 14 cents per pound. At the same time, ethanol was around $1.38 per gallon. As you can see, the price of ethanol is highly correlated with corn and sugar prices. Ethanol futures trade on the New York Mercantile Exchange (NYMEXS) division of the Chicago Mercantile Exchange (CME). Each futures contract represents 42,000 gallons of ethanol, and the minimum tick size is $0.0001 or $4.20. Contracts are available for shorter durations than for oil, gasoline, or other fuels. This is because ethanol is an agricultural fuel and weather has a huge effect on its price. Several companies refine ethanol from corn or sugar in the United States and Brazil. Archer Daniel Midland (ADM) owns processing plants that refine corn into the fuel. Bunge (BG) owns plants that refine sugar cane into ethanol in Brazil. Biofuels like ethanol have become popular in recent years as concerns about air and water pollution increase. 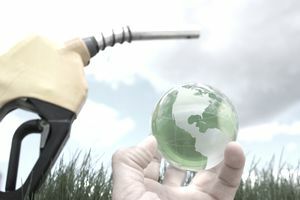 With global population growth, the demand for biofuels like ethanol will grow as environmental concerns support their use as the fuels of tomorrow.